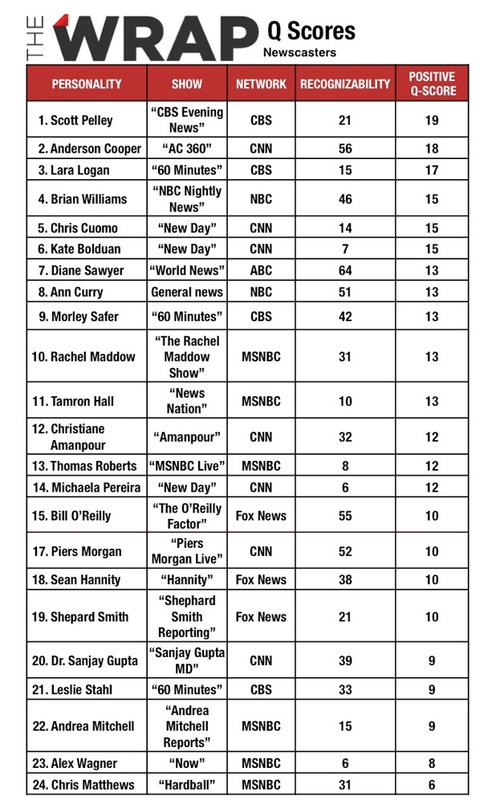 It will come as no surprise, MSNBC’s Chris Matthews was named the least-liked newscasters, based on survey results from the Q Scores company. The ‘Hardball’ anchor Chris Matthews had the lowest likability score of all the names tested, as he registered only a 6 on the Q Score survey. But don’t worry, Matthews had company at the bottom of the list with fellow MSNBC’ers Andrea Mitchell and Alex Wagner. In comparison, CBS Evening News anchor Scott Pelley came in at number one on the list with a 19. What do you want in a newscaster? Accuracy? Ethics? A voice of reason in times of duress? Or do you just want to like your anchor? If the last part is most important to you, then channel-surf no further than Scott Pelley of the “CBS Evening News.” The newsman topped TheWrap‘s list of most and least-liked newscasters, based on survey results from the Q Scores company. Pelley’s 19 Positive Q Score, which measures likeability, helped him just beat the No. 2 guy, CNN’s Anderson Cooper, who had an 18. Cooper’s 56 Recognizability score places him among the highest on this list. “Hardball” host Chris Matthews struck out with the lowest likeability score of all. Its the end of an era at C-SPAN … 70 year old Brian Lamb, the founder of C-SPAN will step down as chief executive effective April 1, 2012. Lamb is handing over leadership to two co-CEOs, Rob Kennedy and Susan Swain. Brian Lamb will remain chairman of the board, with the new title of executive chairman. It is hard to believe that C-SPAN has been on the air for 33 years. For us political news junkies what would we have done without C-SPAN over the years? Many of us today take C-SPAN, C-SPAN 2 and C-SPAN 3 for granted, but 33 years ago when it all started “We the People” could never see what actually went on in the “People’s” House. Thank you Brian Lamb for your incredible vision and allowing “We the People” a peak into what is going on in Washington, DC and being able to hold our politicians accountable.